One week ago I released my OpenREIL project - open source implementation of well known Reverse Engineering Intermediate Language (REIL). OpenREIL library has much more features than just binary to IR (intermediate representation) translation, you can check documentation to learn how to use it and what it can do. 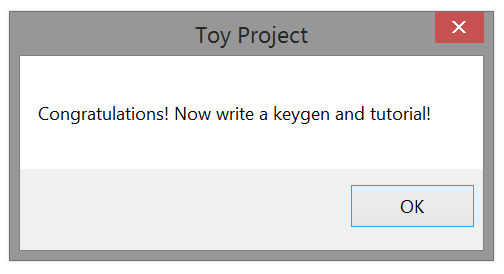 In this blog post I want to demonstrate a practical example of using OpenREIL to solve Kao's Toy Project crackme puzzle with automated algebraic cryptanalysis. Binary code is complicated. 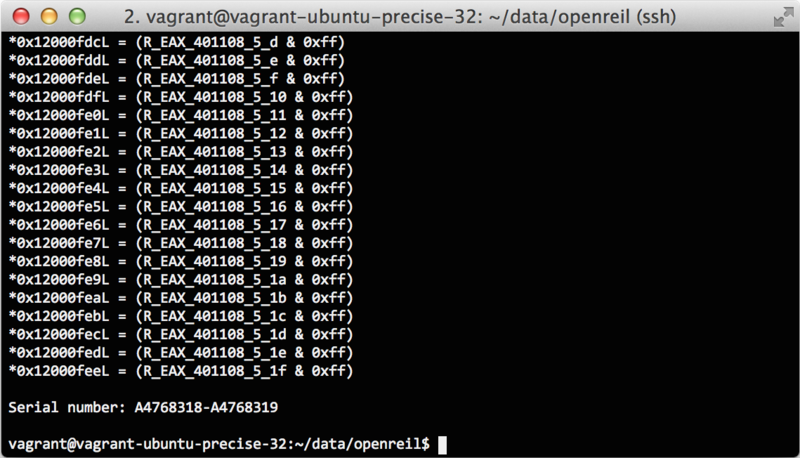 For example, IA-32 instruction set has more than one thousand of instructions, while OpenREIL has only 23. Obviously, it will be much more easy to write a program that analyzes IR code than machine or assembly code. Binary code has side effects. CPU instructions are usually doing an implicit operations like flags computation, also there's a lot of complex instructions that belongs to CISC or SIMD classes. For example, here is BAP IR representation of add rbx, rax x86 instruction, looks much more complex than original assembly instruction, right? addr 0x0 @asm "add %rax,%rbx"
There's a lot of different processor architectures at the market. Using of intermediate representation allows you to make your code analysis logic architecturally independent. Currently OpenREIL supports only i386 (please note that it's very early release ☺) but in a near future I'm planning to add x86_64 and ARM as well, it will be relatively easy because all these architectures are supported by VEX (a part of Valgrind which used in OpenREIL). As you can see, binary to IR translation is definitely a must-have technology for any advanced binary code analysis tool that doing decompilation, deobfuscation or automated vulnerabilities discovery. Without proper IR translation layer it will be horribly hard to implement such things like symbolic execution, abstract interpretation and many others. First, try to solve the problem by hand a bit to develop a feel of the difficulty of the problem. 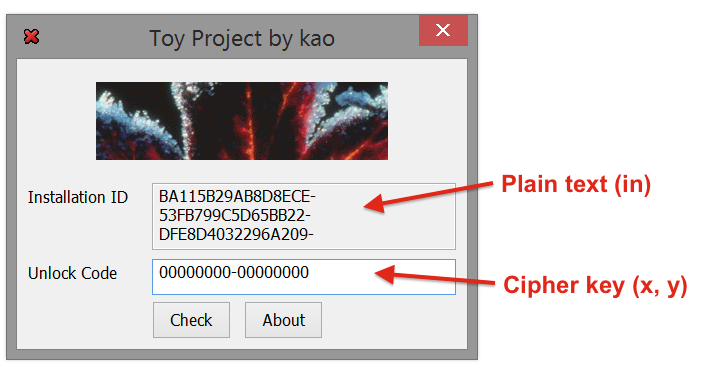 For any single byte pair of plaintext and ciphertext (pi, ci) it’s quite easy to find 8 bits within the key so that the mapping is correct. 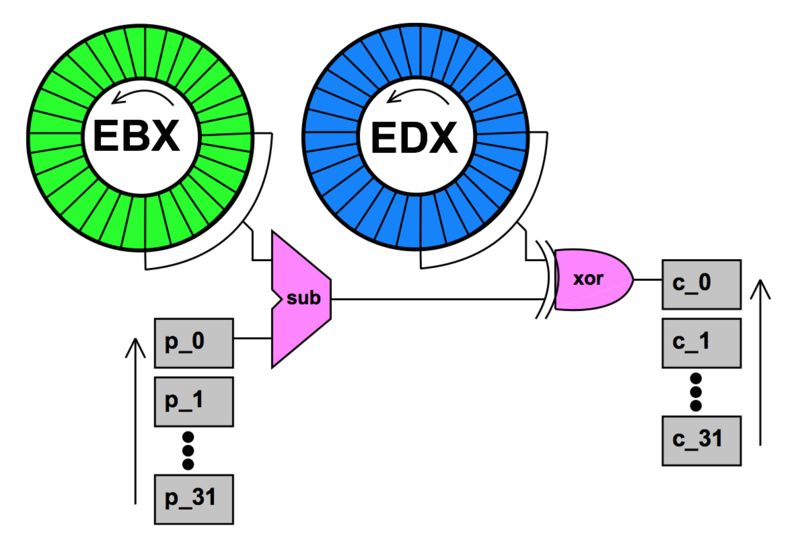 In fact, you can choose ANY byte in EBX to subtract, since you can adjust the difference via the xor by the corresponding byte in EDX. The value of the key for each byte mapping is completely open ended (256 possibilities). But actually choosing a value for the key for that mapping propagates a constraint across the possibilities of the other parts of the key. And this is the beauty of the algorithm. Later after the publication Rolf Rolles released his own solution of this crackme, he used Satisfiability Modulo Theories (SMT) formula and SMT solver to achieve the solution. The formula does not explicitly take advantage of any aforementioned, known flaw in the cryptosystem, and instead encodes the algorithm literally. Symbolic execution was used to produce the formula automatically. Rolf also made a video demo with detailed explanation of all steps that needed to solve the puzzle (trace generation, trace simplification, SMT constraints generation and solving). Unfortunately Rolf didn't published the full code, but there's enough technical details to understand how his solution works. .text:00401114                 push    offset text_valid ; "0how4zdy81jpe5xfu92kar6cgiq3lst7"
As you can see, it loads plain text pointer to ESI register at 004010F7 instruction, then instruction 004010FC loads pointer to stack buffer for ciphered text into the EDI register, encryption key entered by user is stored in EDX and EBX registers. Instructions from 00401105 to 0040110F runs 32 encryption cycles for each byte of input data. At the end of the function, at instruction 0040111D, strcmp() is being called to compare computed ciphered text with some reference value text_valid that hardcoded into the binary - entered encryption key is valid when they are equal. Translate check_serial() function into REIL, apply some code optimizations to eliminate unused x86 flags computations, etc. Mark EDX and EBX registers as symbolic, initialize emulator memory with required global variables (text_valid, installation_ID) and run symbolic execution of our function. At the end of the symbolic execution text_ciphered buffer contents will be represented by 32 symbolic expressions (one for each byte) that accepts EDX and EBX variables as input arguments. Generate SMT constraints for achieved expressions by equating them with bytes of text_valid. Feed generated constraints to the SMT solver from Microsoft Z3 using z3py API, ask solver to check constraints satisfiability and produce valid input for EDX and EBX. # storage with new function code. Unfortunately current version of OpenREIL still haven't symbolic execution implementation, but it provides API for constructing symbolic expressions and IR code emulation, which is enough to implement symbolic execution on the top of the pyopenreil.VM module with extending of VM.Math, VM.Mem, VM.Reg and VM.Cpu classes. Normally, each register of VM.Cpu (which is represented by VM.Reg) keeps current value as Python long, but our new class that inherits VM.Reg uses Val object to store register value. It has two fields: Val.val and Val.exp, not None value of val indicates that it's a concrete value (just like a value of real CPU register), None value of val indicates that it's a symbolic value which expression is stored in exp. Symbolic CPU class also has to_z3() method that returns representation of the trace as list of Z3 bit vector expressions. # and update storage with new function code. My quick and dirty symbolic execution engine isn't perfect, it has certain limitations that makes it unusable for any complex applications: incomplete memory model, very simple symbolic CPU that doesn't support such things like memory writes and jumps with symbolic address, jumps with symbolic condition, etc. Currently I included it into OpenREIL source code tree only as unit test and stand alone test application, but I'm planning to make a proper symbolic execution implementation and API for pyopenreil as well. It took around one second to perform all of the computations, which is very good. Curious reader probably will ask me, is it possible to crack any much or less strong crypto algorithm from real world (like AES, for example ☺) in this way? Unfortunately no, SMT solvers are not magic artefacts and they can't curve laws of mathematics.